There is an abundance of activities to match the tastes, of all visitors, of all ages and all interests, all year round. Situated in Historical, Real and Unspoiled Spain, close to Four Lakes and Three Natural Parks, there are many activities and things to see and do. Please note ; the activities listed below, can be subject to change. They are however regularly updated and amended, once Cueva Santa Maria, becomes aware of any changes. Fuente Nueva, is a place of great paleontological and archaeological interest. many of the remains of these magnificent pre-historic animals, that can be viewed, in Orce’s Museum of Prehistory were found in Fuente Nueva. Orce, (of which Fuente Nueva is a hamlet off), is a short 5 minute drive from Cueva Santa Maria . Orce is a historical and traditional Spanish Village ,whose historic heritage is clearly evident, with a castle, a museum and two historic palaces. Made up of quaint streets and traditional houses. The local restaurants serve the most delicious food but the renowned Segureña Lamb, The village also has a number of good bars a, most of which give free tapes with drinks. With your own swimming pool, as well as, four lakes, local lagoon size municipal swimming pools, fresh water pools, hot water mineral springs and the coast, all within an easy drive of your holiday home; it will not be long before you are relaxing and bathing. Previous guests have on average scored, nearby swimming opportunities, a nine out of ten, (in guest satisfaction questionnaires). We have made available for your swimming days out, ice-box, parasol, picnic plates and cups, beach toys and beach towels, to ensure you have a great day out. Below you will find information on a small selection of what is available to you, for a great day out bathing and swimming and water sports. There are so many good places to eat and drink, that there are too many to mention them all. Click here for those we felt needed a special mention. A trip to the water park in Granada makes for a great day out from your holiday accommodation. Previous guests have spoken hilghly of this excellent water park. There are many exciting water based experiences to be had at this wonderful water park. For example, a variety of water slides, a large pool with wave machine, pirate ship and even a small pool with slide for the small children. There are a number of picnic areas around the large pool with bar and restaurants. The prices are very reasonable at 8 euros for a menu of the day. Sandwiches cost around 3.50 euros. There are also lockers in which to store your valuables so the whole family can enjoy the fun in the water together. These cost 2 euros. These saves worrying about loosing your car keys. There are also sun-loungers and floats for hire. Not too far from your holiday home are landscapes that have attracted Hollywood film markers, since the early sixties.The wind blown sandstone and dry riverbeds of the Tabernas Desert. has provided dramatic backdrops for dozens of 'Spaghetti' Westerns, such as ' A Fist Full of Dollars' as well as Peter O'Toole classic Lawrence of Arabia; other more recent films such as Indiana Jones and the Last Crusade. The Science Park in the city of Granada, is an interactive science museum of 70,000 square meters. It has an observatory, butterfly house, a labyrinth, a place for mental gymnastics and much much more. A day at the park is great for young and old alike. Some guests choose stop at one of the many outdoor picnic spots and barbecue the trout only thing you've got to do is bring a good bottle of local wine and barbecue. Lake San Clemente, is located a short and scenic drive from your holiday accommodation. 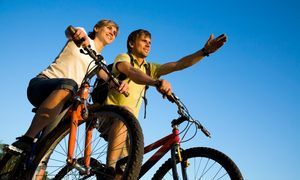 The local Sierras and the surrounding countryside, quiet rural roads and many interesting rural trails, provide excellent mountain biking and cycling opportunities. You can tackle the challenging hills, exhilarating descents, or just take it easy on the flat Altiplano or explore one of the many trails. that start right at your front door. You can rent both mountain bikes and cycles locall, bikes can be available for you on arrival if you so wish. For those that enjoy cycling but don't want to be overly stretched, there are some very pleasant and flat on road cycle routes, with very little traffic on the road. The gentle and flat 15 kilometer ride to the Maria picnic ground makes for a very pleasant day out. Note in July and August , due to the heat, only early morning and late evening cycling is recommended. Enjoy exploring this completely unspoiled part of Spain on foot. This historic part of Spain has remained unchanged for decades. The clean air, tranquility and amazing scenery will make walking in this part of Spain an absolute pleasure. Walking in the local Sierras, (hills) and Campo, (countryside) is very spectacular and miles away from the crowds. It is rare to meet other walkers, even on the more popular routes. Take in the amazing scenery of the Andalusian Countryside; keep your eyes peeled for Eagles and vultures circling overhead; look into the undergrowth for lizards and wild boars. Admire the unusual vegetation and if you plan your route well stop of for lunch in a local tavern. You can taper distances and difficulty of terrain to your own personal requirements. If you so wish you can go on guided walks. With three natural parks with a wealth of marked trails you will be spoilt for choice. There also many footpaths in and around your holiday home. In the information folder at your guest accommodation are a number of maps to assist you make the most of the local walking opportunities. During the intense heat of July and August, walking opportunities are limited. Are Guided Walks Available All Year? Guided walks are available during winter, spring, autumn and early and late summer. Due to the intense heat of July and August guided walks are limited to early morning and late evening. Suitable walking shoes required. Real and Unspoilt Spain Cave House Holiday, Charming and Rustic, Andalusia Cheap Holiday Home with swimming pool, for all year round rental. 3 bedrooms, (2 doubles, one twin) in Andalucia and sleeping up to six very comfortably. Amazing Views, tranquil and peaceful setting, yet close to all amenities. 4 lakes, including Lake Nagratin, nearby for swimming and water sports.. Close to the historic and medieval towns of Orce, Huescar and Baza, with bars, shops, restaurants, museum & castle. Furnished and equipped to a very high standard Great for romantic getaways and family holidays. Casa Cueva vacaciones con Encanto y Rústico, Casa de Andalucía de vacaciones con piscina, de Alquiler durante todo el año. 3 dormitorios, (2 dobles, uno de los gemelos) en Andalucía y con capacidad para seis muy cómodamente. Vistas impresionantes, ambiente tranquilo y agradable, cerca de todo. 4 lagos, incluyendo el lago Nagratin, cer Cerca de las beublos históricas y medieval de Orce, Huescar y Baza, con bares, tiendas, restaurantes, museo y castillo. Amueblado y equipado a un nivel muy alto ideal para escapadas románticas y vacaciones en familia.